Here’s a power strip with six outlets that can be individually controlled using a Wi-Fi app or with voice commands. Those are only a few of the features that are part this device -there are more. Let’s look at them in greater detail. First, this power strip is beefy and substantial. It will handle up to 1875 Watts (15 Amps) and measures 14” x 2-1/2” x 1-1/2” (35.5CM x 6.3CM x 3.8CM). It also provides ETL certified surge protection. There is a physical switch beside each socket for added flexibility. In addition to the six 100~120V sockets, it has three 5V/2.4A USB power ports for charging your devices. 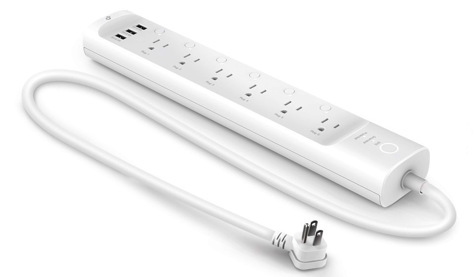 The features that set this power strip apart are in the Kasa Smart app for iOS or Android. 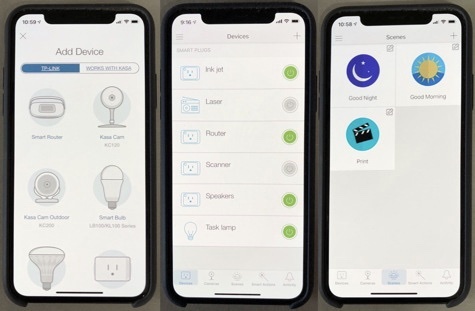 This app controls the strip in a wide variety of ways: Each outlet can individually be turned on or off, timed on/off schedules can be set for each, and scenes can be programmed including ones to turn everything off or on. There is no hub required, simply plug the strip in, download the app to connect it to your Wi-Fi network, and you can start programming things to suit your needs. If you are an Alexa, Google Assistant, or Cortana user, you can enable the appropriate Kasa skill to control the power strip with voice commands. Additionally, the six sockets appear in the app with the amount of power being drawn by each. Many appliances draw power even when they are in sleep mode. The app reveals those and turning them off saves energy. Individually controlling the six plugs on a power strip makes sense when the devices you want to control are concentrated in a small area. As an example, the inaccessible tangle of power cords and cables under your desk. If you choose to control the lights in your living room, you’ll need lots of extension cords so they can all reach the power strip. I suppose I have a Luddite view of IoT, but I fail to see many of the benefits of using voice commands. Saying, “Alexa, turn on my desk lamp” is easy while being the height of laziness, but saying “Alexa, Good night” and having my office equipment shut down is convenient. Turning things on and off from afar can be useful as well. In cool weather, I can turn on the little space heater under my desk so that when I walk into my office, it’s comfortably toasty. MyMac Reviews rating is 9 out of 10. The power strip is robust, well designed, and when combined with the Kasa app, gives you convenient, personal control of your devices.